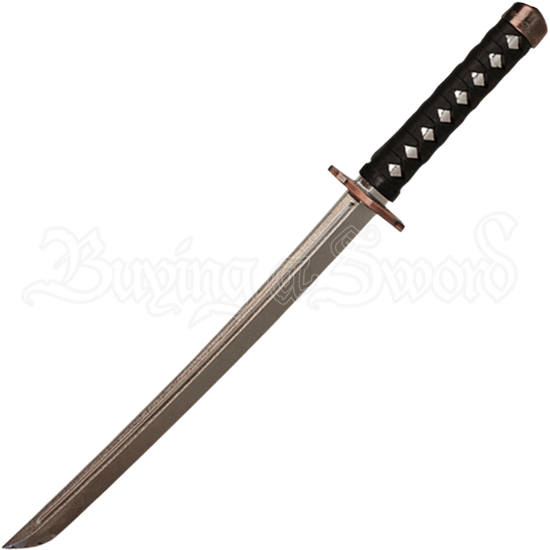 Enhance your practice at full speed and contact with one of our synthetic sparring swords. This Polypropylene Practice Wakizashi blends modern technology with classic design to create an attractive and durable training sword. This polypropylene bokken displays a silver colored blade with an undulating hamon line and a fuller that extends down the spine. The copper colored oval guard exhibits embossed details and cutouts. With a black and silver handle and copper cap, the Polypropylene Practice Wakizashi also makes an exemplary prop for cosplay conventions, Halloween parties, and reenactment events.